Starting any new job can be overwhelming and starting a new job in a completely new county should, in theory, be incredibly daunting. I’m glad to say for me joining Mantis that wasn’t the case. It wasn’t just the promise of working with exciting clients and making a meaningful impact in the public sector that first drew me to the job. It was the incredible warmth of the people I would be working with. In a now infamous three-hour job interview that was spent as much casually engaging me with tales of excellent media relationships and successful campaigns, as it was guiding me through how to become a fully integrated Bristolian, I knew straight away that if I was going to be surrounded from now on by a bunch of strangers, these were the strangers I wanted to be with on a daily basis. In such a short space of time, our work pattern has completely changed. I will always fondly remember the early days of huddling around a table with one or two team members, in an array of trendy city cafés (sometimes on swings). But, the recent opening of our Bristol office, and the addition of some more incredibly bright Southwest based team members, has provided us with a great base to work together on a daily basis. It’s also provided me with a lot of comfort on the days where I’ve very much felt like a new person to both job and city. This is of course all whilst still having the flexibility to work from home if needed, offering some much needed headspace for those days when you have two press releases, a blog and case study to draft. 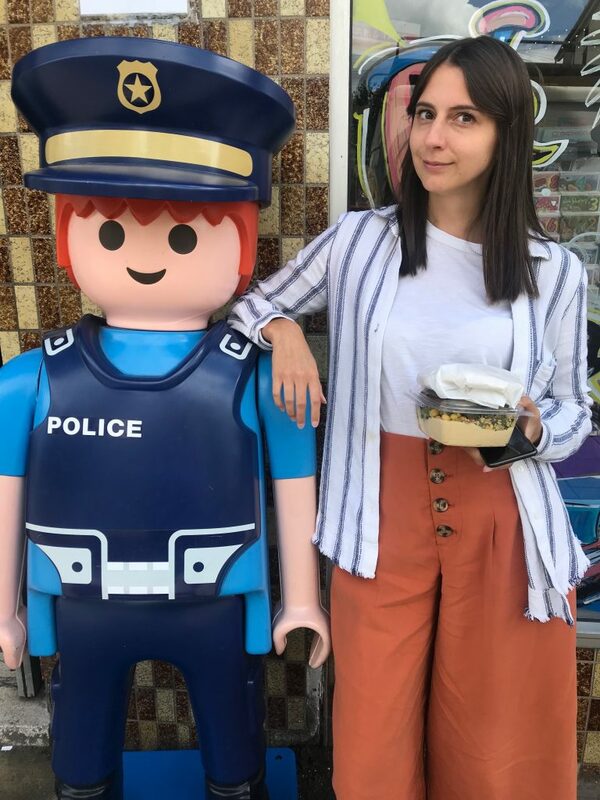 Now 100 days in to my career at Mantis I feel I’ve learnt a great deal, for example, travelling from Bristol to London takes as long as travelling from London to – well – any other part of London; that there are way more emojis out there than I ever thought imaginable, and to never take a photo with a giant Lego policeman because it can, and will, haunt you for life. More than anything, I have found that I’m constantly inspired by the incredible work ethic and knowledge of the Mantis team. I’ve always felt that the key to not just ‘good’ public relations, but excellent public relations, is the ability to see a story at face value and find something else in it – to be able to pull out the human-interest angle and really engage the interest of the reader. Mantis takes this to the next level, by not only fully understanding the story, not only by fully understanding the client, but also by having in-depth knowledge of the market the story sits in, and the governing bodies, local authorities and policies that influence it. As a result, I’ve found that my approach to public relations has become so much more targeted. I’ve learned to cut through the noise and the desperate pitching, to create stories I know will be interesting and to send them to journalists that will definitely find it relevant to their work. I love working with business technology providers because there are often many layers to a story and getting to grips with a completely different side in the public sector has been fascinating. I’m pretty proud to be part of this team and I’m incredibly grateful for the support and guidance I’ve received in my time here.